It's the bunch of noodles by the top of the photo. From the "buffet" cafeteria. Didn't check what it is actually called in Japanese - sorry! Anyways, it wasn't so spicy, and in fact it tasted great. :) No spiciness, no fireworks. Nonetheless, have a great 2013 ahead! Only ~220 yen at the OK Everyday Low Prices supermarket in downtown Atsugi, compared to the usual ~260 yen at Lopia supermarket in Atsugi Trellis. This one is made by Nippon Ham / ニッポンハム / nippon hamu. They also call this as piza / ピザ, not pittsa / ピッツァ, but the two mean the same thing. They also advertise that there are three kinds of "natural cheese" / nachuraru chiizu / ナチュラルチーズ in this thing, plus teriyaki sauce, of course, and, well, corn. Of course. I checked the ingredients, and apparently there's also some margarine / marugarin / マルガリン in there somewhere. But overall, it's quite a delicious but inexpensive meal. Very spicy, Chinese-style ramen noodles. 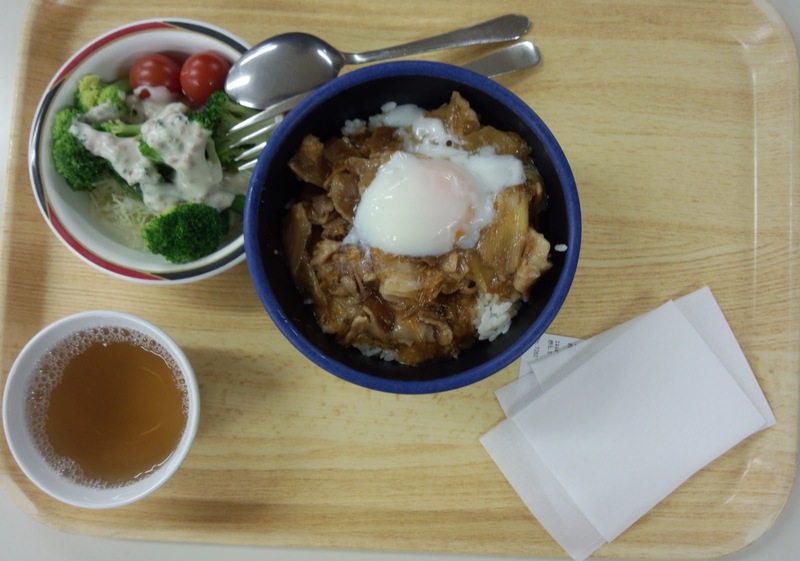 But this is actually Japanese-style, with the egg and the little bit sweet meat, and not very, very spicy unlike in actual restaurants and maybe unlike in China. To me, it looks like spaghetti with the water undrained. Check out Wikipedia. Why are there a large variety of Kitkat flavors in Japan? My app says 10 degrees. This is an extreme though. My other thermometer, which was more under shade than this, was saying 15. Later that night, my weather app said 0 degrees, one thermometer said 0, one thermometer said 2. Bento! #187: McDonald's "Chikin Tatsuta Wafuu Oroshi Baagaa"
670 yen for a regular "M" set, plus 100 yen I think to upsize to an "L" set. There is actually a chikin tatsuta (only) set for 20 yen less. 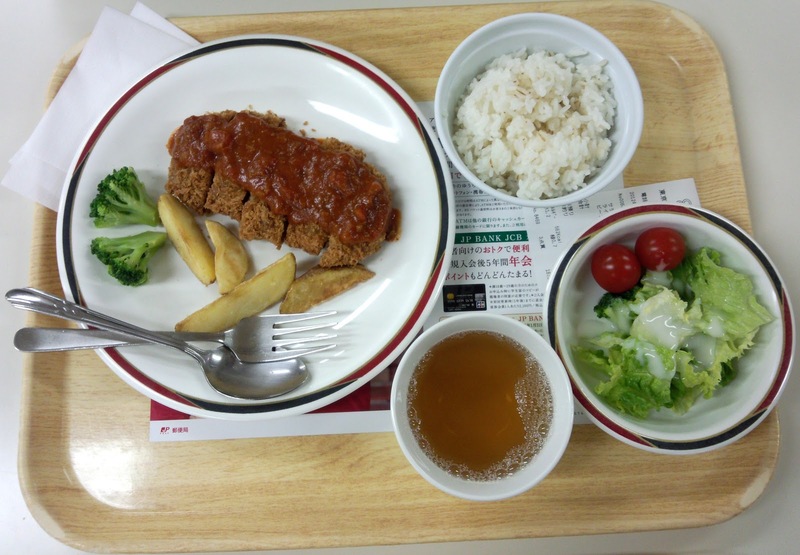 Chikin tatsuta / チキン竜田 / チキンタツタ = Japanese-style fried breaded chicken fillet. Wafuu / 和風 / "our" (Japanese) style. oroshi / おろし = sweet sauce with mashed radish. baagaa / バーガー = burger. I got a "food magnet" - with a chicken nuggets design - for free with this meal. You can see from the box what the ingredients are: cabbage, the wafuu oroshi, the chicken tatsuta itself. The bun. And lemon. They didn't show it here, but the cabbage was almost drowning in mayonnaise - but not Japanese-style mayonnaise, mind you. And that mayonnaise was mixed with lemon. The taste of the lemon was quite strong here, but it wasn't bad at all. Or チーズグラタンハムカツ / Cheese Gratin and Ham "Cutlet." 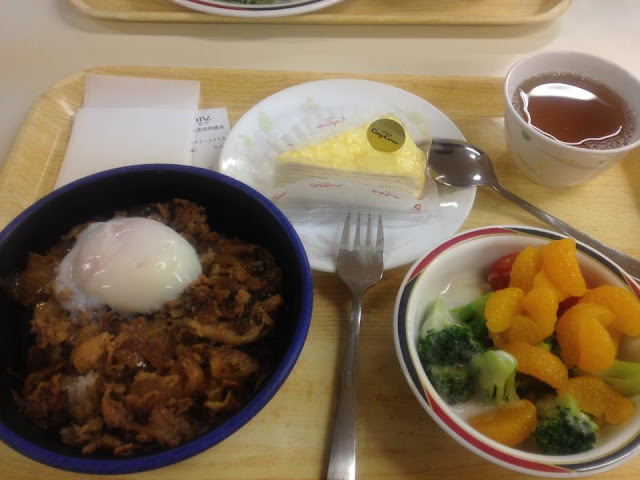 It's just 105 yen each from the cafeteria, it's that thing on the lower right. I also got sasami chiizu katsu / ササミチーズカツ / chicken fillet and cheese "cutlet," that thing on the upper left (157 yen each), but this time I used tonkatsu sauce, instead of ketchup. For the CGHC, I tried it with ketchup and mayo. 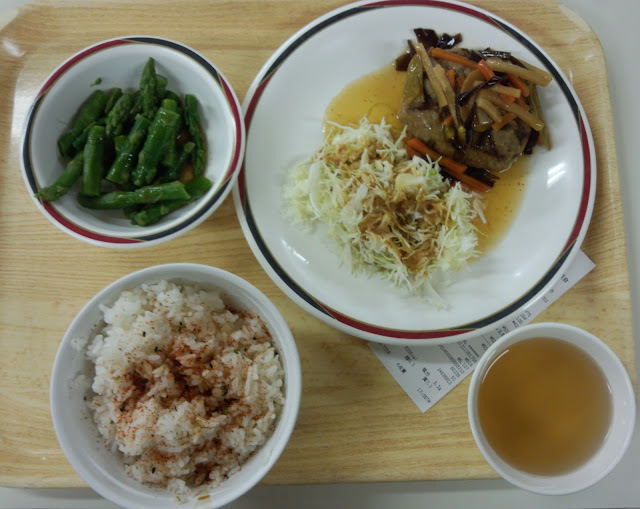 On the upper left, the "Vegetables with Brown Sauce" / ブラウンソースの野菜. But, they explained that it's basically demi glace sauce. Just as I suspected. There's broccoli, cauliflower, carrots, and pumpkin in there, but I didn't get potatoes. This whole plate -- inclusive of two grilled chicken fillets, lettuce, cherry tomatoes, half a frankfurter with ketchup, and two cream puffs (ice cream inside!) is just 498 yen. I also have 98 yen (i.e. not so much) of rice on the side. Dars (ダース / daasu) Bitter (ビター / bitaa) above. Kitkat "オトナの甘さ / otona no umasa" = sweetness for adults??? 甘辛チキンバーガー / uma kara chikin baagaa / sweet and spicy chicken burger. 450 yen for a regular set. Plus 110 yen for an "L" set. Dom Dom's regular hamburger, "only" 180 yen. Love the beef(?) patty, (pause), ketchup, (pause), pickles, onions on a sesame seed bun. Yum, yum, yum. 398 yen from the supermarket. Good for one lunch. Merry Christmas / merii kurisumasu / メリークリスマス. "Cut Fruit" / カットフルーツ / katto furuutsu. I got this because it's just double the price for quadruple the amount of fruits. Being a beach-loving dude from tropical Philippines, I'm always concerned about the weather and, more specifically, the temperatures here in Japan. I'd like to call myself a summer person, because I realized that while we in the Philippines consider the temperatures there from December to February as cool, they're still actually summer temperatures in other countries, Japan, included, and even warmer than the summers in even more countries and places. Anyways, so I always check the weather and temperature forecasts practically on a daily basis. In fact, maybe almost on a bi-hourly basis. I always felt Accuweather has the most accurate temperatures (at least for current conditions), but now I installed my own adhoc thermometer just outside my window, and now I'm using three other weather apps: Meteorologist on my desktop, the default Weather app on my phone (Yahoo!-based weather actually), and this "Celsius" app, also on my phone. I took screenshots of the temperatures at one time, and here they are. Or, spicy pork ramen. Ton / とん = buta / ぶた = 豚 = pork / pig. Kara(i) / 辛(い) = spicy. Whoops, I forgot how much, but somewhere around 400 yen. Or less. Or more. I forgot, sorry! "Anything goes" lunch box. お好みのり弁当 / okonomi nori bentou, where okonomi is the same as in okonomiyaki or okonomi soosu (okonomi(yaki) sauce), and nori = the seaweed typically used for sushi. 430 yen from 3F and yummy. December arrived and the temperatures started not going above 10 degrees. At one point, different weather sites reported temperatures of -1 to 0 degrees, although in my ad hoc home measurements, it only became as low as 1-3 degrees. I thought winter was here already. Alas, by the end of the week, temperatures even reached 18 degrees by my measurements. Starting last night though, there were strong winds. I thought it was nature's way of blowing away the leaves from the trees, and from the ground to certain spots so that they can easily be taken away to become food for next year's new trees and plants and flowers. Alas, today, most red and yellow and brown leaves are now almost gone from the trees. Winter is near. Can you see the chrysanthemums? Oh and those reddening autumn leaf colors. Well don't be surprised, now, right? I heard this is healthy though. Good cholesterol? Hooray for that! By the way, sorry, I forgot what this is called! Didn't get much sleep before taking this lunch, and I ended up with almost 750 yen worth of food. There's that pork katsu with mayoneezu, hamu katsu, chikin tatsuta something, and ebi furai (shrimp fry). The latter, fyi for those who don't know, is different from ebi tempura. I also got this boiled egg that's been in some kind of soy-sauce-looking sauce (though it wasn't so soy-sauce-salty). And I also got this I don't know what it is but they call it shuu kuriimu, or cream puff, with ice cream inside. And I also got this limited edition "Christmas tiramisu," which is the rather expensive item here, at 210 yen. Bento! #172: A special, limited edition "hamburg"
Tastes like sweet and sour, actually. More like sweet.